I’ve recently found out and shopped at OurHarvest. Our Harvest is an online farmers market that connects us consumers to local farmers and food producers (currently for the NYC area only). Through partnerships with farmers, fishermen, and food artisans, OurHarvest purchases and sources their products locally to maximize freshness; hence ensuring quality and traceability while keeping costs down and combating hunger at the same time. For every delivery above $25 it receives, OurHarvest also donates a meal to a family in need through its relationship with the Food Bank of New York City. My recent shopping haul consisted of a pasture-raised whole chicken from a farm in Greene, NY (a small town in Upstate New York), fresh large bunch of radishes by Phillips Farm in New Jersey, butterhead lettuce by Gotham Greens in Brooklyn, fresh kale from Satur Farms, an olive bread loaf by Sullivan Street Bakery, white corn tortillas from Tortilleria Nixtamal (a NYC gem for authentic Mexican tortillas), culinary grade matcha green tea from SerendipiTea, creamy peanut butter by Saratoga Peanut Butter Company, and honey by Andrew’s Honey. The produce was impeccably fresh and the chicken is not remotely close to the stuff you pick up in supermarkets. I was freakin’ excited to cook up dishes with these beautiful ingredients. Since I have brunch with a few friends at home, I thought of a huge spread based on my haul from OurHarvest. I’ve marinated my chicken simply with garlic, salt and pepper overnight and roast it until golden brown and delicious the next morning. I’ve used the dark meat from the roast chicken and coarsely chopped it. 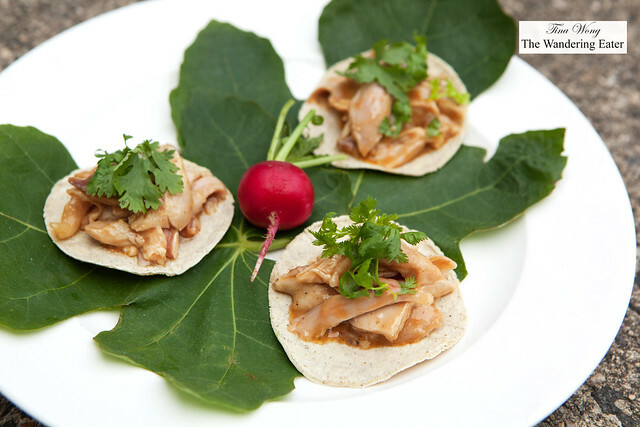 Lightly toss the chicken with my homemade peanut satay sauce and pile the meat on to the lightly warmed white corn tortillas and a couple of sprigs of cilantro — chicken satay tacos. 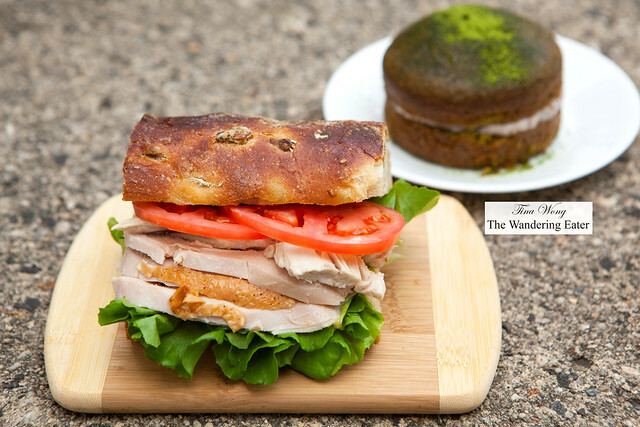 The white meat portion of the roast chicken was made into fancy sandwiches. I sliced the olive loaf in half and layered on homemade aioli, the tender butterhead lettuce, chicken and tomatoes. Dessert were matcha cakes with black sesame frosting. 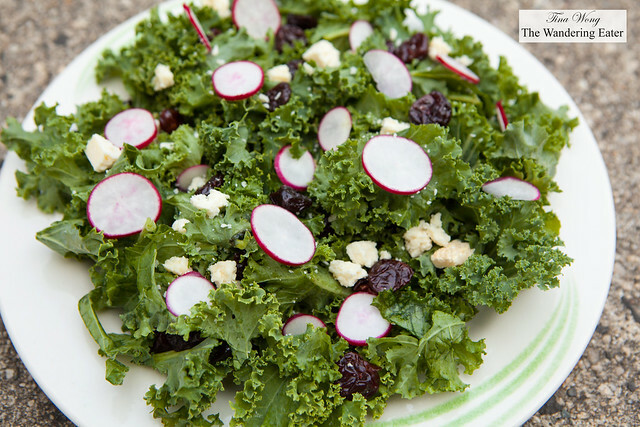 To balance out this meal, I made a kale, dried cherries, ricotta salata and radish salad with lime vinaigrette. Hearty, healthy and so delicious. 1. Mix the salt and pepper in a small bowl. Set aside. 2. Rinse and pat dry the whole chicken. Lightly rub the olive oil all over the chicken and sprinkle the garlic and salt-pepper mixture on the chicken and lightly rub to coat. Wrap the chicken and place it in the refrigerator to marinate overnight. 3. Remove the chicken from the refrigerator about 15 – 20 minutes prior to roasting. 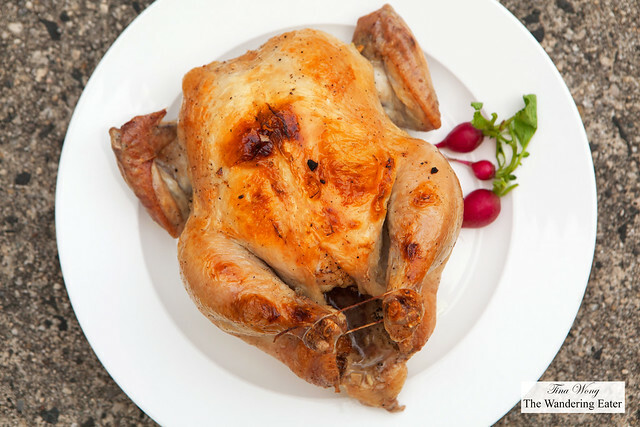 Preheat oven to 375°F and roast the chicken for about 40 minutes or until the internal temperature is read 165°F when the thermometer probe in the breast. 1. Put all the ingredients, except for the coconut milk and lime juice into a blender and puree until smooth. 2. Add the coconut milk then the lime juice to taste. 3. Check seasoning, adding any one of soy sauce, honey, chilli and fish sauce to suit your taste. In a large bowl, add the chopped chicken and peanut sauce just enough to coat the chicken. Add the chicken to the center of the warmed tortillas and add a few sprigs of cilantro. Enjoy. Various location sites and dates to pick up your order within New York City boroughs and in Suffolk county.